From thirty yards in to the cup is the decisive area of any golf hole. 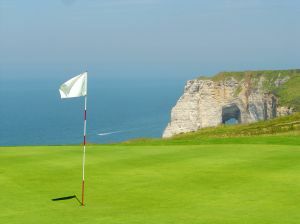 It is here, most of the time, that the score on the hole is determined. In this area, at point-blank range so to speak, the hole is finished off smartly or it is ruined. Often a bad start from the tee or a poor second shot is atoned for by a brilliant approach and/or a fine putt. More often, unfortunately, the advantages of a good start and adequate play through the fairway go up in smoke because of the approaching or putting, or both. The only time the short game, in one or another of its phases, is not important is when we hit a long shot to within inches of the pin. How often does this happen? The short game is a forte of the touring pros. Realizing its value, they work on it continually, especially their putting. They use the short game primarily for the birdies they need if they are to win or stay in contention, and, secondly to make up with a par for any errant shot off the tee or through the fairway. The pros need the short game to turn 72's into 66's and 67's, for they will hit from 12 to 17 greens in par figures in the course of a round. How much more valuable, then, could a good short game be to the average golfer who goes around in from 95 to 105 and hits only two or three greens in par? Think of the shots he could save with a game around the greens that was not brilliant but just reasonably reliable. Imagine how his scores would drop if he could get the ball in the hole in three shots instead of four from twenty or thirty yards, if he frequently took two from the edge instead of three, if he got out of green-side traps in one instead of two or three, and if he holed the two- and three-foot putts he now often misses? Well, a reliable short game can be developed, though like any other phase of golf it takes work. This, though, calls for technique of a different kind and work of a different kind. It calls for the development of touch, rhythm, and judgment, as distinguished from comparatively big and violent body and arm action to gain club speed and power. Aggravating as the short game can be when it lets us down, it has two good points. Not much room is required topractice it and no great strength is necessary to become proficient in it. Any high-handicap player can develop a short game as good as the club champion's with work, though neither could ever get his distance off the tee. As we see it, the short game falls, into four categories: the short pitch from thirty yards down, the green-side trap shot, the chip from the fringe, and the putt. For the average player the primary object of the approach and the trap shot are to get the ball on the green. Just that alone. For the better player the object is to get the ball close enough to the cup to get down with one putt. Yet the club to be used and the basic manner of playing the shot are the same for both. The difference in objectives is possible because the good player has better control through his superior execution and confidence. If your swing has improved with the few tips in this site, imagine how much improvement you can make by following the full course!